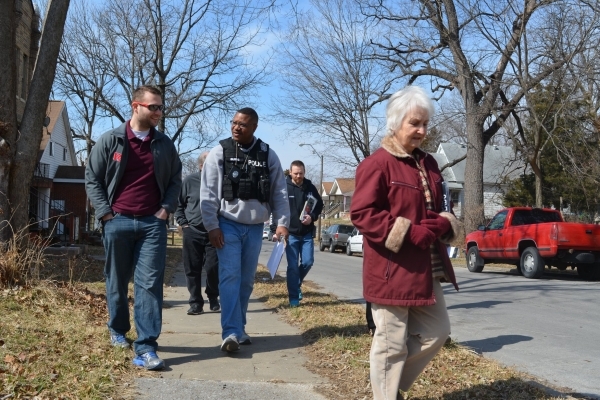 He watched the film with nearly 40 other people around his age, all from areas of Kansas City that the No Violence Alliance Commission considers high-crime epicenters. The teens’ summer job was to create six murals about the musical’s themes for the Lyric Opera of Kansas City. In the movie (an adaptation of “Romeo and Juliet”), Tony and Maria fall in love, but the two are from opposing gangs. When Tony is killed, Maria blames both sides, which seems to make the other characters rethink violence. But Greer says that’s not how it works. “Nowadays if you kill somebody, they’re going to have to kill somebody back,” he says. Ultimately, Greer spent 10 weeks pondering the story and how it relates to what he sees around him every day. Helping him think it through was artist Michael Toombs, who created Teens in Transition five years ago at the request of the Jackson County prosecutor. Toombs had worked in family courts and the juvenile justice system for 13 years, and representatives from the prosecutor’s office thought he would be able to provide a service for at-risk juveniles. Now, each year the Kansas City Police Department selects about three dozen people between 14 and 17 years old to participate in the art-focused program. The teenagers have not necessarily been in trouble with the police, Toombs emphasizes. “Because of where they are, they could be a target for trouble. By getting them involved early on in things like this, it sometimes redirects the trajectory of their lives,” Toombs says. Greer, who is a good student and an athlete with plans to go into accounting, says he was called out of class in the spring and asked if he’d like to participate. When the administrator said Greer would receive a minimum-wage stipend for participating, he agreed because, he says, decent summer jobs are hard to get. But as Toombs points out, the program is about more than a summer job. Each year, Teens in Transition has a different creative project and brings in professional artists who engage participants with poetry, prose, painting, videography and fashion in order to find something that appeals to each. 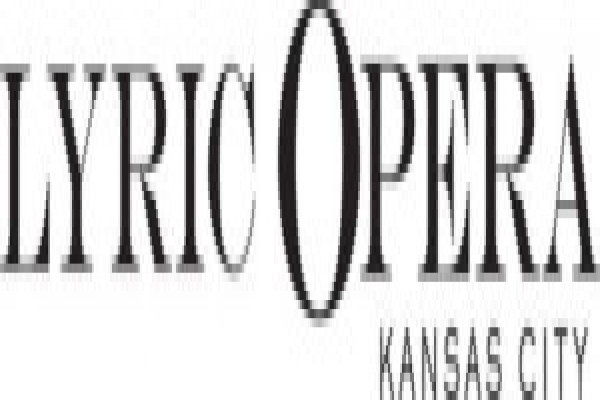 This year was the first time they partnered with the Lyric Opera. Opera companies in Houston, Kansas City, Atlanta and Chicago, and at New York’s Glimmerglass Festival, will share the same set and costumes for “West Side Story” over a one-year period, Brand explains. 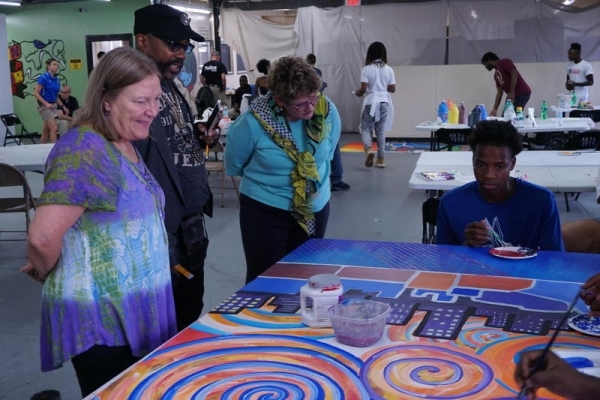 Any murals created by those five companies will travel to each of the five destinations, including four of the six panels by Teens in Transition (the remaining two panels are community-oriented and will remain in Kansas City as part of an Open Spaces exhibition). Greer hadn’t painted at all before this summer. He says he enjoyed it, but will probably still turn to basketball as a stress reliever and time-filler in the future. For him, the summer’s biggest takeaway is his altered perception of the police. Like schools, Teens in Transition employs several student resource officers. Before the program, Greer saw police officers as important to avoid. Now, he says, they just seem like people in uniforms who are trying to do their jobs. That's helpful because at the end of the summer, Toombs says, the students go back to their original environments without support, which worries him. Brand says watching the process was a growing experience for her, too. In addition to the plot point that Greer didn’t agree with, Brand says the students distrusted the characters’ ability to fall in love at first sight. “They said, ‘No, I don’t think that would happen,” she says, because the rules against crossing the lines run so deep. What did ring true, and what some teens depicted in their murals, is the strong bond of loyalty they feel for each other. That loyalty can be good or bad, and is tested when the kids return to school. Teens in Transition murals at the Lyric Opera atrium 5 p.m.-8 p.m. Friday, September 7 at the Beth Ingram Administration Building, 1725 Holmes, Kansas City, Missouri 64108; and 90 minutes before each performance of "West Side Story," September 22-30 at the Kauffman Center for the Performing Arts, 1601 Broadway Blvd, Kansas City, Missouri 64108.